In photography, exposure is used to mean two things. Photograhic films or sensors have a certain senitivity. That means that a certain amount of light needs to be able to reach the film or sensor, before the image is correctly exposed. An exposure can also refer to a photo exposed that way. Longer exposure times mean a lighter image. 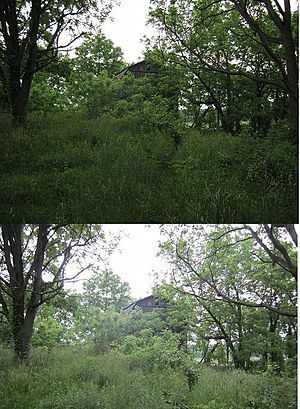 A photograph may be described as overexposed when it has a loss of highlight detail, that is, when important bright parts of an image are "washed out" or effectively all white, known as "blown-out highlights" or "clipped whites". 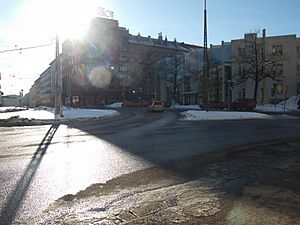 A photograph may be described as underexposed when it has a loss of shadow detail, that is, when important dark areas are "muddy" or indistinguishable from black, known as "blocked-up shadows" (or sometimes "crushed shadows", "crushed blacks", or "clipped blacks", especially in video). As the adjacent image shows, these terms are technical ones. There are three types of settings: manual, automatic and exposure compensation. A camera in automatic exposure (abbreviation: AE) mode automatically calculates and adjusts exposure settings to match (as closely as possible) the subject's mid-tone to the mid-tone of the photograph. For most cameras this means using an on-board TTL exposure meter. Aperture priority mode (commonly abbreviated to Av) gives the photographer manual control of the aperture, whilst the camera automatically adjusts the shutter speed to achieve the exposure specified by the TTL meter. Shutter priority mode (commonly abbreviated to TV) gives manual shutter control, with automatic aperture compensation. In each case, the actual exposure level is still determined by the camera's exposure meter. A photograph of the sea after sunset with an exposure time of 15 seconds. The swell from the waves appears as fog. Exposure (photography) Facts for Kids. Kiddle Encyclopedia.